January 2011: REACH Delivery International is today announcing the launch of REACH Delivery, a new service that will enable chemical manufacturers, importers, distributors and downstream users to guarantee the secure delivery and receipt of Safety Data Sheets (SDS) and associated documentation when they ship chemical substances to customers within Europe; a key requirement of EU REACH legislation. The launch, open to all companies worldwide, is scheduled for 10th January 2011, with REACH Delivery currently accepting selected clients to start using the system prior to the formal launch. To comply with REACH, vendors are now responsible for ensuring the delivery of SDS and associated documentation to their customers and for keeping these documents up to date in the event of any changes or clarifications. Suppliers will no longer be able to simply publish these documents on a website or in a catalogue of SDS for customers to access. Sending the latest SDS in the post or by email will be inadequate as companies will not be able to guarantee delivery, nor record proof of delivery without significant additional time, effort and cost. In addition, traditional delivery methods will not provide any automated process to accommodate the REACH regulations when supplying SDS updates to customers. And, this is not a challenge that individual organisations will be able to solve by developing a proprietary document delivery system, as this would be unworkable in a global industry. Jo Lloyd, Director at REACH Ready commented: “With the completion of the first phase of REACH registration, many manufacturers and importers of chemicals are now revising their SDSs to incorporate new hazard and risk information they have learned during registration or in reclassifying their substances according to the new CLP regulation. The new year will see a flurry of revised SDSs enter the supply chain and keeping track of what has been sent to which customer and ensuring ‘delivery’ will bring its own headaches - regulators have been quite clear that suppliers are now responsible for delivering revised SDSs to their customers. As part of our Matchmaker service, REACHReady is keen to promote tools that help facilitate REACH and CLP compliance and welcomes this new management product from REACH Delivery, a REACHReady Approved Supplier”. REACH Delivery is an online service which enables the electronic delivery, receipt, control, update, audit and tracking of Safety Data Sheets in line with the REACH regulations. It is a free to use service, with an optional ‘pay as you use’ area for users wanting to send documents externally, who will then pay a low ‘per document’ fee. Recipients of the SDS and other documents are able to use the service completely free of charge. 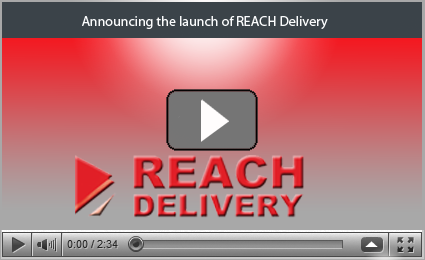 REACH Delivery requires no lengthy implementation or training. A simple set up and registration process will enable users to send securely the latest versions of SDS directly to their customers’ desktops and receive proof of delivery and receipt as soon as their customers access the documents. An audit trail of all activities related to their documents is provided to demonstrate compliance and reduce the risk of any potential enforcement and legal action. REACH Delivery users benefit too by being able to distribute the SDS throughout their company, via REACH Delivery, free of charge, ensuring the very latest SDS are always being used across their organisation. The system notifies them immediately of any changes to any information in their SDS, with an updated version replacing the previous one so only the very latest version is in use. All SDS will be held securely on a central repository, accessible only by the document owner or a recipient to whom they have sent the document. Users can also, optionally, elect to store copies of documents locally on their own machines, for online or offline operations and still guarantee that these documents are automatically kept up to date. Malcolm Carroll director at Reach Delivery commented: “REACH Delivery is a solution that will eradicate the headaches around sending and receiving Safety Data Sheets. It provides a simple and effective way for companies to meet the challenges of REACH compliance and allows organisations to manage their own internal operations ensuring the use of only current information and providing consistency across all operational areas. “The system is easy to use and free of charge unless you send documents externally – customers can scale up depending on their needs. It offers an unrivalled service and provides a sophisticated many to many communication environment for document delivery, management and REACH compliance. We are delighted with the initial feedback from the Chemical Industry and we anticipate REACH Delivery will quickly become the defacto standard for SDS delivery worldwide,” he added. 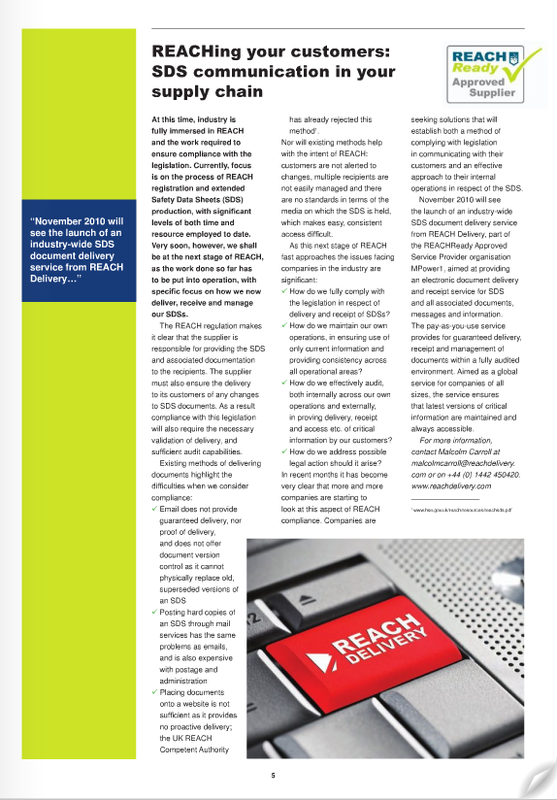 The October 2010 edition of the REACH Ready Review magazine devoted a full page to an article entitled REACHing your customers: SDS communication in your supply chain written by REACH Delivery. The article addressed the challenges currently faced by many companies seeking REACH compliance and the opportunities that technology, such as REACH Delivery, provide to address those challenges.